Finding Nemo starts with two clownfish, Marlin and his wife Coral, who are just settling in their new home in the Great Barrier Reef bringing along with their eggs. It is not long before a barracuda attacks their home which knock Marlin unconscious. When he regains consciousness, he discovers that Coral and most of their eggs are gone. It is fortunate that a lone egg survived which he decides to call Nemo. Nemo hatches and grows to be a fish with a smaller right fin incurred by the barracuda when it attacked their nest. The disability limits Nemo’s ability to swim, making Marlin worry about him constantly. During a school field trip, Nemo leaves his group and gets caught by some scuba divers. When he learns that his son is missing, Marlin sets about finding him. During his journey, he meets Dory, a regal blue tang afflicted with short-term memory loss. 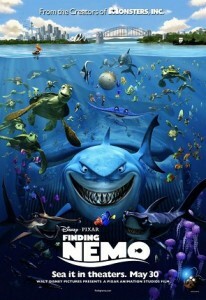 As the two continue on searching for Nemo, they become friends with three sharks and finds the diver’s mask which can potentially lead them to Nemo’s location. Their excitement causes Dory to hit her nose and make it bleed, attracting the attention of one of their shark friends. It leads to a chase that causes the two fish to lose the diver’s mask into a deep sea trench. Marlin and Dory continue to search for the mask in deep waters until the moment that they are pursued by an anglerfish. During their struggle, the light of the anglerfish casts light on the labeled mask and Dory successfully reads the address indicated on the mask. The pair head for Sydney and almost lose their lives among a bloom of jellyfish. Marlin wakes up on the back of a sea turtle who calls himself Crush. He befriend Marlin and Dory and helps them reach the East Australian Current which will get them closer to Sydney. During his time with the turtles, Marlin tells them about Nemo and the story starts spreading throughout various points across the ocean. On the other hand, Nemo ends up in the fish tank of Dr. Philip Sherman, a dentist practicing in Sydney Harbor. Inside the tank, he becomes friends with Tank Gang, composed of Moorish idol, a puffer fish, a yellow tang, an ochre starfish, a royal gramma, a pacific cleaner shrimp, and a blacktailed humbug. The tank fishes learn that Nemo is to be given as present to the dentist’s niece, who is infamous for being fish killer. To save Nemo, Gil, the Moorish idol, shares his plans on how Nemo can escape the tank once he’s in the hands of the dentist’s niece. A brown pelican named Nigel then comes and shares the story spreading across the ocean about Marlin. Because of this, Nemo becomes encouraged and puts into action Gil’s plan of jamming the tank’s filter. However, the dentist immediately replaces the jammed tank filter. In the East Australian Current, Marlin and Dory get trapped inside a blue whale. Dory tries to talk to the whale and persuades it to take them to Port Jackson. There, they meet Nigel who recognizes Marlin from all the talk that has been spreading all over the ocean. Nigel takes the pair to the dentist’s office only to find Nemo floating unconsciously inside a plastic bag held by the dentist’s knee. Without their knowledge, Nemo is only pretending to be dead so that he get to be flushed in the toilet. Marlin sees the supposedly dead Nemo. Thinking that his son is dead, he leaves Dory alone and starts grieving on his own. However, Nemo escapes using Gil’s help and he reaches the sea through a drain that leads to the ocean. On the other hand, Dory feels confused when Marlin leaves. She then comes across Nemo who has just gone out from the drain pipe. Dory makes the word “Sydney” from the drain pipe and her memories about Marlin comes back completely. She recognizes Nemo as Marlin’s son and the two of them find Marlin. As soon as father and son reunite, Dory gets caught in a fishing net currently sweeping up a school of grouper. Nemo tries to help her and proves to his father that he must not be worried about him all the time. The movie ends with rest of the tank fish escaping to the ocean while Nemo, Marlin, and Dory go back to their home in the Great Barrier Reef. Nemo tries to follow the escape plan but fails and everyone thinks that he died when he got flushed out from the toilet bowl.